Purifying water can be a complex process and you will find it tough to change filters again and again. To add to that, if you are a technically challenged person, then it might become a gigantic task for you to pure the tap water with the traditional water filters. Besides, none of the traditional water filters will filter the water perfectly and thus, you will be forced to drink contaminated waters. However, in this situation, Culligan US-EZ-1 EZ-Change can help you out because it is an under sink filtration system with loads of premium facilities. In addition, it will clean and pure the water effectively. 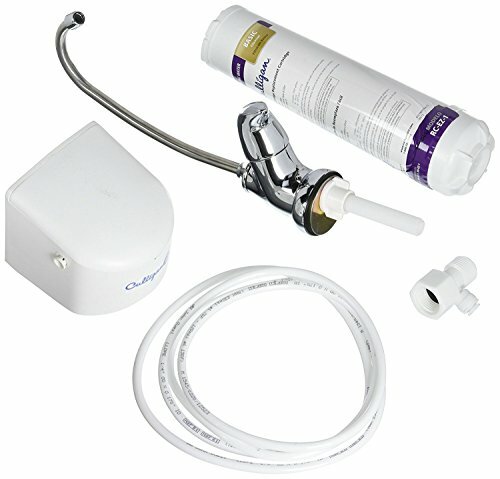 So, just read the review carefully and be familiar with the fine points of this unique water filtration system. Let’s have a look at the review. What Is Culligan US-EZ-1 EZ-Change Filtration System? Culligan US-EZ-1 EZ-Change is one of the finest water filtration systems of modern times and it can provide up-to-the-minute water filtration. Additionally, it is not an expensive product and it will offer fresh along with clean water to home or office and this water filtration system will remove and reduce the unnecessary odor, bad taste, and chlorine along with class-III particles from the water. It has an excellent design and appearance, which will come in handy while fitting it to the sink. There is a twist-on off mechanism that keeps the fitting procedure simple. To add to these facts, this filter system has the ability to filter three thousand gallons of water and the lead-free faucet will not contaminate the water as well. All of these things make the water filter a reliable and durable one for purifying the water. After buying the Culligan US-EZ-1 EZ-Change, I explored that the product is lightweight in nature and weighs only 2.4 pounds. What’s more, the measurement of the filter was 3.8 by 8.2 by 12.2 inches. So, I was telling myself that the weight and the dimension altogether make this product a compact and easy-to-use one. Furthermore, I was thoroughly satisfied with the operating temperature requirements as it would need minimum 40°F/ 4.4°C and maximum 100°F/ 37.7°C to operate at my home. Additionally, I was totally impressed with the system’s filter capacity as it can filter 3,000 gallons/ 11,356 L in the first level and at the third along with the fourth levels the filter capacity will be 500 gallons/ 1,893 L. Besides, the system’s service flow rate was 0.5 gpm/ 1.9 lpm, which is a nice as well. There is no easier thing than installing the Culligan US-EZ-1 EZ-Change because, at the time of installation, I did not have to make any extraordinary effort. Additionally, the only hardest thing that you might have to encounter is drilling the whole under your sink. On top of that, it took only an hour to install this filtration system in my home. Before the commencing installation procedure, I took all the necessary hardware’s with me. Apart from this, the entire faucet stem were tied with nylon rope, but they were not so sturdy. Another thing that I did was to bring all the brass fittings from the hardware store. So, to install it, I did not buy any extra add-ons and every instruction is given in the manual. The level of performance that I got from Culligan US-EZ-1 EZ was off the hook because, in this price range, there is no better filter than the Culligan US-EZ-1 EZ. I was clearly able to purify the tap water and I did not found any odor or bad taste of chlorine as well. Besides, the unit is NSF certified so; it was able to remove the class-III particles from my home’s tap water. In the end, I would say that the performances of this water filter meet my expectations and above all I was totally happy with it. If you buy a product, but can’t use it properly, then I have to say that the product is not a standard product. However, in that regard, Culligan US-EZ-1 is a perfect filter with great usability. As I said, the installation process was fairly simple one; I was able to replace the filter easily. It has a twist-on and off mechanism, which will be used to change the filter. This makes the product a unique one compared to other products in the market. Additionally, the quick-connect fittings will ensure that the filter stays set up until the replacement time and you can stay stress-free as there will no hidden leaks or spills. Culligan US-EZ-1 EZ will get remove all the odor and bad taste from the water. It will provide you fresh as well as clean drinking water to your family. It can eliminate the class-III particles from the water along with chlorine odor as well. The filtration system is blessed with high-tech filtration system. The system will provide mess-free replacement of filter. It designed in a way so that it can be fitted to any kitchen sink at any home or office. The filter is portable in nature and easy-to-install. Additionally, you can replace the filter in a minute with twist-on and off mechanism. It has quick-connect fittings that make it a compact one. It can filter 3,000 gallons of water and is highly useful to any user. Although it has many positive sides, it has few negative sides as well. If the installation of the product is not performed correctly, then it might end up with leaks. To conclude the review, I would like to say that this filter is for those who are in need of fresh and clean water. Additionally, as it can filter 3,000 gallons of water, it will certainly come handy to the big families as well. So, if you are looking for a filtration system that has durability with high-tech features, then it should be Culligan US-EZ-1 EZ. Therefore, buy it and enjoy clean and pure water with great taste.